Half of San Francisco’s traffic signals were supposed to have transit priority installed by this spring, according to the ambitious schedule set out by managers of the Muni Transit Effectiveness Project two years ago. This may not come as much of a surprise, but the SFMTA isn’t quite meeting its target. Of the 600 signals to be upgraded, the SFMTA expects to have 170 completed in the spring, according to agency spokesperson Paul Rose. Installation of those signals, which are all along the 14-Mission and 8X-Bayshore routes, began last fall, with the N-Judah next in line. The on-board equipment needed for the signals to detect the buses and trains, then turn or stay green, has been installed on the 316 vehicles stored at the Flynn and Potrero Muni yards, said Rose. The next transit priority signals are set to be installed along the N-Judah, Muni’s busiest line, over the coming year. The signals are part of a package of proposed TEP upgrades for the N, which the SFMTA will explain at a community meeting Thursday in the Inner Sunset. In conjunction with those improvements, the SFMTA also plans to replace rails and other infrastructure in the Sunset Tunnel during 15 weekend closures, which will be the focus of another meeting on Wednesday in the Lower Haight. The overhauls proposed for the N should bring a quicker, more reliable commute. Plans include transit bulb-outs on Irving Street (which will also make the street more pedestrian-friendly) and stop consolidations. Stops will also be moved to the far side of the transit priority signals (so trains can board after clearing the intersection), and new signals will replace some stop signs along Irving and Judah Street. Altogether, the SFMTA expects the improvements to save to 1.5 minutes in each direction, or 25 percent of the trip time, in the stretch between Arguello Street and 19th Avenue. The physical street changes on Irving are set to come with a re-paving planned in spring of next year. The bulb-outs would replace up to 30 parking spots, which is expected to be the biggest point of contention from merchants. But as Inner Sunset resident Greg Dewar noted on his blog, the N-Judah Chronicles, “Many changes have been made in other neighborhoods with success, and no armageddon for local residents and businesses.” On Carl Street in Cole Valley, plans for transit bulbs at Cole and Stanyan Streets were watered down to preserve a handful of car parking spaces, despite the pleasant boarding experience they bring for tens of thousands of daily riders. 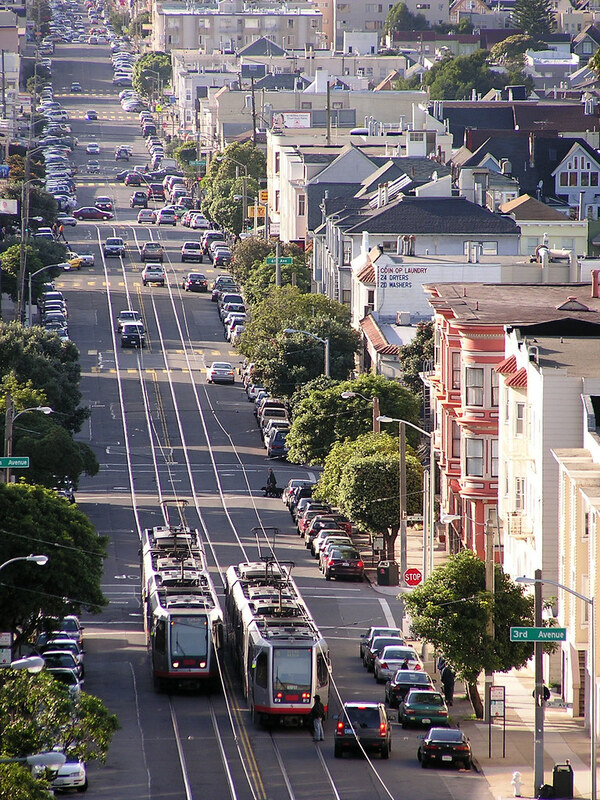 As an Inner Sunset resident myself, I’ll be cheering the N upgrades, while voicing one big concern — the transit bulbs, as planned, would force bicycle riders on Irving to ride on or next to the Muni tracks, a dangerous and harrowing situation. (Irving is arguably the most heavily-used and practical route for bicycling in the neighborhood.) There appears to be ample room to include a bikeway between the sidewalk and boarding island, akin to the one installed at Duboce at Church Streets and planned on Masonic Avenue and Second Street. Hopefully, we’ll continue to see that type of best practice design incorporated as the badly-needed TEP bulb-outs come to fruition on Muni routes around the city. I like the bulb-outs Muni will make for the N-Judah. Scares the crap out of me when I exit the outbound N-Judah at 9th and Irving and see a car pass by while people are exiting. I hear ya – when I go home this is a problem, especially when drivers are impatient. also, many many drivers seem to believe Irving is a 4 lane road, when it is not. Also in support of the proposed improvements to Irving Street – great opportunity to increase the N’s performance, while also enhancing the neighborhood’s public realm. One potential issue to be worked out: at 9th/Irving, if the N’s stop is moved from Irving to 9th (after the turn) and a 2-car transit bulb-out is built, we might loose the neighborhood’s only parklet in front of Arizmendi. If the bulb-outs look like they do in Cole Valley – boring grey concrete without any landscaping or seating – the sidewalk may be wider, but the public realm will loose out. Hopefully there is some $$ for planters, street furniture, and the like to put on those nice big sidewalk extensions. The planters they added at the Duboce Park end of the Sunset Tunnel double as great places to sit. Food for thought for Thursday evening. I forgot to mention, I hope Muni can find a way to prevent drivers from making dangerous left passes of the N-Judah at the UCSF stop. It’s not just illegal, it’s a head-on collision just waiting to happen. There is a similar problem on Castro, with drivers treating the existing wide lane in each direction as two lanes. That problem should go away with the sidewalk widening project, which will reduce the lanes to a more standard width. Maybe something to consider in the Inner Sunset? Aaron, Has the SFMTA provided a revised schedule for completing: 1) the 600 signals to be adapted for transit priority, and 2) the completion of TEP? I thought the first was to be done by now, and the second by 2017. On that note, when are they going to turn on the transit priority lights on EMB? Not a fan of the Duboce/Church bike superhighway. It gives bikers the impression they don’t have to stop for pedestrians in the crosswalk (saw one recently almost mow down some tourists, including 2 children), and they don’t stop for riders off boarding the N. It’s a matter of time before someone gets injured. There’s a similar problem on Ulloa where the L-Taraval waits to turn into West Portal. Especially in the morning with drivers heading up Lennox to West Portal Elementary, there are too many impatient parents who risk a head on collision with an OB MUNI train or SB Car. AND it’s also clearly a hazard for pedestrians (many who are kids crossing to the 48 bus stop…) All in the name of saving 15 seconds, they risk their lives and put many others at risk! I’d agree that the Duboce/Church island, with a bike lane between it and the curb, is less than 100% successful. I cycle more than I take Muni, but I do remember exiting the N at Duboce and Church, and being hissed by a cyclist who didn’t feel it necessary to slow and be aware of pedestrians crossing the bike lane, with a tram parked and discharging passengers there. Might be mitigated with a sign saying “Yield to discharging passengers” or something, of course. Indeed, the Embarcadero plus the T-line have transit preferential signaling hardware installed yet still cars are given priority and the streetcars end up sitting idle at stops. And Mission St has had the hardware for a while, but it has been perpetually broken. Just because they are installing the hardware doesn’t mean it is going to make a difference. The transit vehicles have to actually be given priority and the hardware needs to be maintained. I predicted as much when it was first proposed. Sorry but not surprised that my prediction is coming true. I hope that this dangerous and harrowing situation is not duplicated on Irving Street. The Duboce/Church bikeway design is a little different than the typical ones, in that the bike lane is sunken rather than raised, but I haven’t heard of any collisions or frequent conflicts there. The configuration has been used in cities including Vancouver and cities across the Netherlands and Denmark. Can you suggest a better way to design it? I know it’s kind of dorky, but why not put bike signals at the ends of the platform? When a train is at the platform they would go red or at a minimum flashing yellow. I’m generally on the side of cyclists, but they can be pretty rude to pedestrians. Not so very different from their compatriots in the powered machines. Your pictures don’t show 40 pedestrians trying to crowd on/off a streetcar. I would replace the green=go neon speedway paint with stripes or another pattern to indicate conflict. And add some ridges or a bump, as shown in your second picture, to indicate it is not an acceleration zone. How quickly everyone has forgotten the short platforms that had passengers stepping of the train right into moving car traffic. 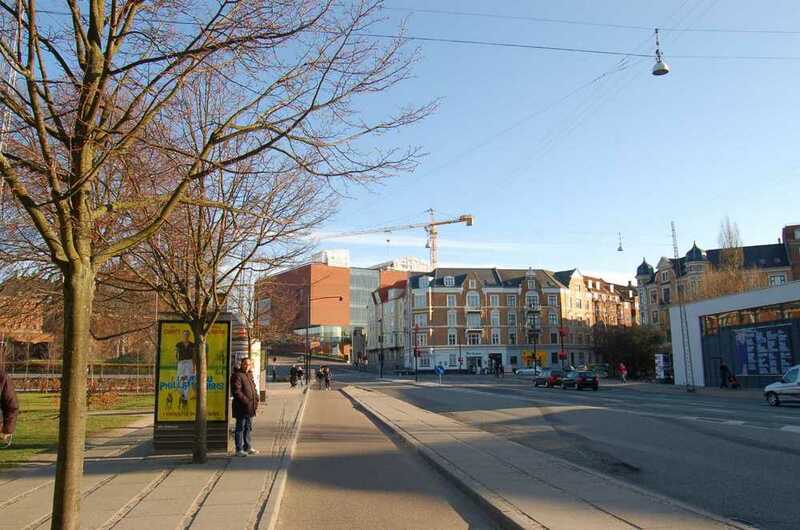 Unlike when we had to exit into car traffic, there now wider boarding islands and I don’t know that I have ever seen a bike riding on the platform, but I frequently see pedestrians crossing through the green marked bike lanes instead of walking all the way up to the corner. The bike haters probably haven’t taken notice of how few pedestrians use the crosswalk instead of walking right across the bike lane. It was never fully installed or set up properly as I was told. Unfounded concerns over car congestion coming right on the heels of construction that had already removed god-given traffic lanes for an overpriced light-rail line that who knew if anyone would even want to ride it, and the usual lack of proper time and funding to deal with all the obstacles thrown up along the way made it easy to drop lower priority items. In the context of the era, having a train in the first place was a step up, shouldn’t that be enough? There is a lot of work on the Embarcadero extension which still isn’t finished, like those temporary barricade fences along the median that have been in place for over a decade, and the sad fact is that project just fell by the wayside and picking it up again would be starting from scratch. I bring this up as a cautionary tale against getting cold feet partway through construction. One problem is that, even assuming that cyclists should yield the right of way at the boarding island, there is nowhere for cyclists to stop other than in the intersection itself at Church and Duboce. Also, when a full lane (that cars can use) is next to a boarding island anywhere in SF, vehicles have the right of way, and pedestrians have a crosswalk. I don’t agree that because this is now a bike-only lane, pedestrians suddenly have right of way instead of bikes. When I’m a pedestrian offboarding MUNI here, I use the crosswalk just like everywhere else in SF. And if I decide not to use the crosswalk, then I first look for oncoming (bike) traffic before stepping out into a (bike) traffic lane. Why not do this on Market St and every other muni stop that has a lane of traffic to the right of it? Oh, right, that would impact people driving, nevermind. I’ve often wished I had a golf club with me while exiting the N and L for this very reason. Stick it out the door first to remind drivers they have to stop. And if any windshields get broken as the cars whiz by in the process, well that can be a learning experience for the driver. The problem with the restricted far right lane is that ALL traffic needs to merge into those lanes to take a right turn. Too many people do not know that and this accounts for a lot of right hook accidents, near misses, and a lot of frayed nerves. The SFMTA would do well to educate people about the right turn lane protocol, and they should also paint right turns and bus lanes, or bike lanes, or whatever on the street so EVERYONE knows what they are supposed to do. You mean we need better testing from the DMV? How are these people licensed drivers if they don’t know how to operate their vehicle properly? “Dangerous” and “harrowing”?! Seriously? Don’t you think that’s a little extreme, especially since you have zero evidence of anyone being injured here (though I’m sure you can tell us a great anecdote or three about how a bicyclist did this or that “horrible” thing). If this stretch is “dangerous” and “harrowing”, what does that make Market and Octavia where pedestrians and cyclists are routinely killed and injured? Tone down your verbage; just because you don’t like it (or all bicyclists for that matter) doesn’t mean that it’s “dangerous” or “harrowing”. You are completely out of touch with what actually presents risk in our city. It’s scary to think how many others are like you and unable to think rationally about the *actual* dangers to pedestrians (cars). Agree about the perception that Irving and Castro are 4 lane roads. But responsibility for this falls to the MTA for designing such a traffic sewer. There is no reason to be wasting space like that. It should be reclaimed for either wider sidewalks and/or cycle tracks. If Duboce & Church is ever signalized it will be to deal with the car traffic blocking up the intersection. Assuming pedestrians all walk to the corner to use the crosswalk instead of jay-walking through the traffic lanes, with prioritized signaling cyclists would get held at the light, but as the starts moving and triggers the signal, it will also unleash the flood of backed up cyclists. For an outbound N coming out of the tunnel, that would mean bike traffic having to wait for the train to pass, the cross to the north side so the bulk of the cyclists would be passing right as the train is offloading. For the inbound direction it would mean all the passengers coming off the train would be held at the crosswalk as the train passes on the one side and that pack of cyclists which had been stopped also starts moving. If you mean completion of the TEP plan, the deadline for public comment on the draft environmental report was due in September. The Planning Dept. is required to answer those comments in the final report which should be due within the next few months, and will ultimately go before the Board of Supervisors for final approval sometime this year. Full implementation will entirely depend upon available funding and voter support for the upcoming ballot measures to raise the $3 billion needed. Something to keep in mind as TEP projects (like this one) are built is that funding is frequently dedicated to only certain types of projects. At times low-priority projects are going to move forward before more important projects because they’ve been paid for. For example, every historic streetcar project meets criticism about catering to rail-fans and tourists over other needs, when the simply fact is hybrid-electric busses aren’t eligible for historic preservation and restoration grants. Nah. Keeping things as is seems to be a case of no-one-wins-but-no-one-loses-either–it’s not really ideal (and maybe not even technically legal) for bikes to not stop and wait. But bikes aren’t cars, and as Jamison said, bikes stopping en masse at a signal or something is just going to completely gum that intersection beyond the clusterfudge it already is. At the very least, pedestrians might just get confused, wondering why cyclists aren’t just passing in their lane before they cross to the sidewalk. My recommendation, as always, is for cyclists to install a bell. They’re not expensive or difficult to use. I use mine a lot (and I get results, even from drivers). But I’ll also add that I’m gonna yield to a pedestrian if he wants to cross the bike lane there, of course. I’ve observed conflicts between cyclists traveling on Duboce and pedestrians crossing between the N-Judah boarding islands and the sidewalk. You’re right, Aaron, that it’s not fundamentally different than the boarding islands on Market street that sit between motor traffic lanes. The difference is that most people, unfortunately, don’t treat a bicycle lane with the same respect as a normal traffic lane. Pedestrians will blithely step across the bike lane without looking, while they’re more likely to look and yield on Market. It’s the same problem cyclists face on John F. Kennedy drive — people don’t respect the bike lane as travel space and step across it without looking, park strollers in it, go jogging down it, park in it, and so on. The same thing happens in the bicycle lanes on Market Street today, and it will probably continue depending on what kind of bicycle lane or cycle track design they pick there for the Better Market Street project. vcs (below) suggests adding signs or paint; you could even put up a railing to channel pedestrians to the crosswalk (similar to the boarding islands on Market Street), but I think that erodes a lot of the boarding island’s benefit. I wish I knew a better solution, but I think what you’re seeing here is the fundamental problem with lots of “cycling infrastructure”; it ends up being a second-class facility that makes cycling less appealing, both because it increases cyclists’ travel time or puts them at higher risk of collision with pedestrians or other vehicles. I guess one other thing you could do is leave a little more room in the regular travel lane, so there’s a comfortable space for cyclists between the streetcar tracks and the curb. As long as the overall space was still narrow enough to prevent double-parking, the transit speed benefit should still be there. Aaron likes improvements on the N Judah but doesn’t like bulb outs. Can you make up your mind, cannot have it both ways. There is nothing dangerous about bulb outs. They are for pedestrians. No one is forcing bicycle riders to ride next to or on Muni tracks. That is their choice. Would it be possible to use other streets instead of Irving? Don’t know which boarding island is in question. Outbound from UCSF the first boarding island is on 10th & Judah. How much ample room is needed? How many blocks would the green bikeways cover? No one is forcing bicycle riders to ride next to or on Muni tracks. That is their choice. That is like saying no one is forcing N Judah riders to exit the train at stops that have cars whizzing by. Wait until the next stop. Who needs bulbouts – you aren’t forced to cross the sidewalk there, get a car hippie. I like bulb-outs designed to safely accommodate bicycling, which means not forcing people to ride in a lane with rails. When I say “boarding island,” I’m talking about a bulb-out which effectively becomes a boarding island as the bikeway runs through it. What you are writing is nonsense. N Judah passengers can only exit at doors. There are signs for drivers to wait behind a streetcar at stops. Some of them do not wait and almost run down passengers boarding/exiting the streetcar. Every street corner doesn’t have bulb outs. I’m not forced to cross the sidewalk there but It helps. Aaron was claiming the bulb outs on Irving St. will force bicyclists to ride next to or on streetcar rails. Irving St. is busy with the N Judah; passengers boarding/exiting the streetcar; pedestrians and vehicles. I asked is it mandatory for bicyclists to use a busy Irving St. Is Irving St. the only east-west street in the neighborhood? There are bike lanes on 5th, 6th, 7th Ave and sharrows on other streets. Thanks Aaron for the image. From what I see the Portland bulb out is in the middle of the block not at the intersection. What happens in Portland when there are 20-30 passengers who are boarding/exiting the streetcar and no room on the island? Can they stand in the bike lane as a boarding island?